I feel like I should be writing this post in French, but the truth is my French is a bit rusty so I will spare you. I was in a very playful mood when I put together this outfit, and because we haven't made any plans for vacation this summer, all I do is daydream about it. So for today I imagined we were somewhere in Provence (such a cliché, I know), sitting in a charming little cafe in a small village, having lunch and enjoying the subtle lavender smell. 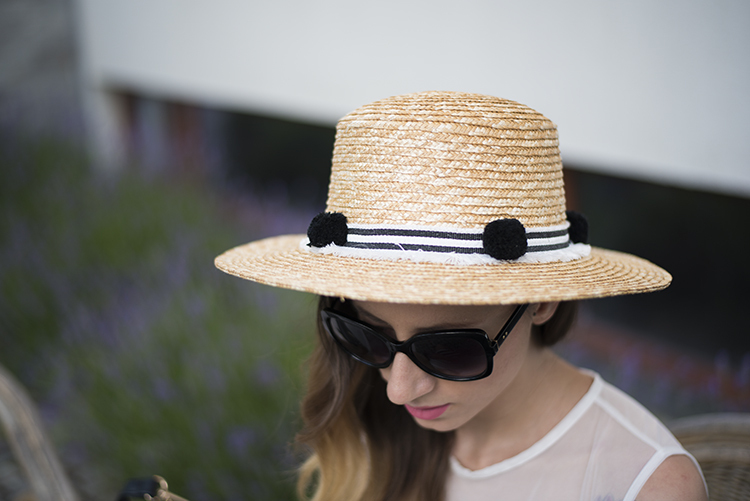 I've got my fancy straw boater hat on, dark sunnies and the most gorgeous white off the shoulder top with tiers and tiers of ruffles on the sleeves, and a chic little striped skirt. I am wearing flats for a change, one because we are on vacation (duh!) and two because they are super comfortable on these cobbled streets. OK, time to wake up and get back to reality, Miha! I am actually only a 5 minute drive away from my apartment, but in this setting I do feel like I am somewhere far away even if just for one second. Do you have any suggestions for this summer vacation?